June 5, 2018 — Like many alumni, Matt Horstman ’99 has fond memories of Grinnell College, though he also recalls the pressure involved in studying at such a rigorous academic institution. Horstman was not alone in the sentiment. During the 139th Alumni Reunion Weekend May 31 to June 3, Grinnell graduates from classes ranging back to 1948 enjoyed the company of classmates while reflecting on what the College has meant to them over the years. Reunion attendees chat at the All Reunion Social on Saturday. Reunion is the largest Grinnell alumni event held each year. 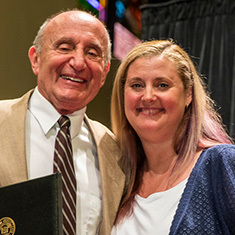 About 1,100 alumni returned to campus to take part in Reunion 2018. Throughout the weekend, alumni attended lectures, participated in activities, toured the campus and community, and formed bonds over shared experiences at social events and meals. This year’s featured Reunion classes were the classes of 1947, 1948, 1949, 1950, 1963, 1964, 1968, 1972, 1973, 1974, 1977, 1978, 1993, 1997, 1998, 1999, and 2008 though alumni from several other years also attended. Attendees were from 45 states, Washington D.C., and five countries. Kathy Bateman ’97, Leif Brown ’97, and their 8-year-old daughter, Athena Bateman-Brown, drove to Grinnell from their home in Austin, Texas. It was Bateman’s first time visiting the College since she graduated 21 years ago. Bateman met her future husband on the first day of college. She and Brown lived on the same floor in Smith Hall. She said she’s dreamed of returning, but it hadn’t been possible until this year. Beverley Stubbee ’48, left, Hester Newton ’49, Don Yungclas ’50 and Pat Yungclas ’51 attendee as the 70th Reunion Cluster. Few people could speak to the College’s growth over the last 70 years better than Don Yungclas ’50, who was attending Reunion with his wife, Pat Yungclas ’51. The couple still reside in Grinnell. Along with Don, Beverley Stubbee ’49 of Durham, North Carolina, and Hester Newton ’49 of Muskegon, Michigan, were 70th reunion attendees. Newton co-presented an Alumni Award to her son, P. Carter Newton ’77, during Alumni Assembly in one of the most uplifting moments of the weekend. This year’s other Alumni Award recipients were Peter Kranz ’63, Deborah Feir ’68, Catherine Gage ’73, Barry Huff ’73, Douglas Spitz ’78, Rachel Bly ’93, Margaret Tandoh ’93, Kirpal Singh ’97, and Adrienne Enriquez ’98. Kranz, who ran track at Grinnell, marveled at the College’s athletic facilities and came away impressed with how academic excellence has stayed constant during the past 55 years. “It’s interesting to see how Grinnell has grown while being able to hold on to the quality, which to me is the most important aspect,” Kranz said. Kranz’s classmate, Julia Johnson Rothenberg ’63 made the trip from New York for her fourth Reunion weekend. Preceding Reunion on May 30 and 31, Alumni College held courses based on the theme of “The Truth.” A record total of 132 alumni went back to the classroom for lectures and seminars that examined the problem that is truth. The 140th Annual Alumni Reunion will take place May 30 through June 2, 2019. Featured classes are the following: Classes of 1959–60 (cluster), 1969, 1979–80 (cluster), 1983–85 (cluster), 1994, 2003–05 (cluster), and 2009.